Arthur Loughton was born in 1931 and raised on the family farm near Cambridge, England. He attended the University of Nottingham where he graduated with a Bachelor of Science and Master of Science in Horticulture. Rhubarb was the subject of his Master’s research. It was at university that Arthur met Ruth Bullivant whom he later married. They had two sons Martin and Graham. The Loughtons moved to Canada in 1967 when Arthur accepted a position as a Research Scientist at the Vineland Research Station. Arthur became internationally renowned for his research on rhubarb and he travelled extensively lecturing on the subject. He also played an instrumental role in the introduction of the seedless English cucumber to the Ontario greenhouse industry by pioneering its cultivation. On April 1, 1975, Arthur was appointed the Director of the Simcoe Research Station. While there, his research focused on cole crops including cabbage, broccoli, cauliflower, and brussel sprouts. His work was so appreciated by the industry that Stokes Seeds Ltd., named a cabbage variety after him – Loughton. In 1986, Arthur was seconded from his position at the Simcoe Research Station to become Manager of the Transition Crop Team for the Ontario Ministry of Agriculture and Food. The team’s mandate was to examine the potential of non-traditional crops to be used in Ontario’s agricultural industries. This research led to the legacy of crop diversity seen in Norfolk County today. Arthur resumed his duties as Director of SRS in April 1991 until his career retirement in 1996. Arthur was a member of the Ontario Institute of Agrologists from 1987 to 2007. The OIA recognized Arthur in 2000 with their Distinguished Agrologist designation and he was named to the OIA’s President’s Honour Role four times. When not working, Arthur enjoyed spending time with his family, loved playing cricket, reading and was a crossword “fiend”. Near and dear to Arthur’s heart was the Rotary Club of Simcoe of which he was a Past President. 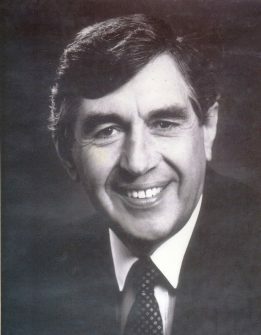 In 1998, he received the Paul Harris Fellowship. This is the highest honour a club can bestow upon a person, either inside or outside the organization. The award acknowledges “service above self” which that individual has offered to their community, their nation or indeed to the world. Arthur Loughton certainly personified this lofty and noble goal. Arthur Loughton’s legacy to the agricultural industry has and will continue to have a lasting impact here in Norfolk County and beyond. Click through the gallery below for photographs of 2015 Agricultural Hall of Fame inductee Arthur Loughton. Loughton family at Christmas, 2007.